Please check with our Resort Concierge for the most updated information as we continue to add to our slate of adventures. UPGRADE YOUR PRIVATE ISLAND EXPERIENCE. Want to take your BVI private island experience to the next level? 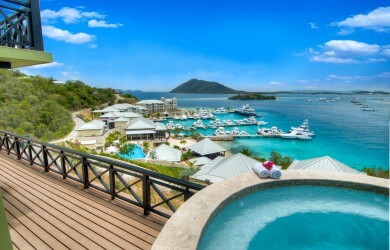 Choose from a distinctive selection of Scrub Island luxury villas, relaxing spa services, and delectable culinary adventures. Go ahead. You deserve it. For the ultimate in BVI luxury, stay in one of our exquisitely appointed 2-, 3- and 4-bedroom oceanfront villas. Surround yourself with spectacular views, expansive balconies and a private pool just for you. Ixora Spa’s location and views alone will rejuvenate you. Refresh. Revitalize. Repeat. Imagine what an exquisite spa treatment will do. Find pure bliss. The soothing sound of waves beside you. The soft sand of Pavilion Beach beneath you. Brilliantly starry sky above. And a delectable meal before you. 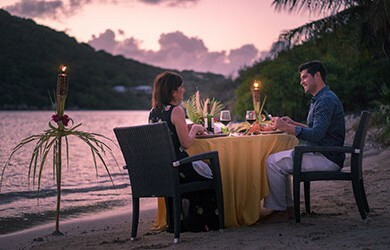 Our private Candlelight Dinner on the Beach is deliciously romantic.